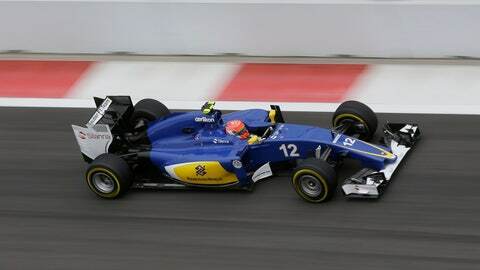 Felipe Nasr of Brazil steers his Sauber around the Sochi Autodrom Formula One track. Felipe Nasr was one of the unsung heroes of the Russian GP as he earned sixth place, the best result for both the Brazilian and his Sauber team since he finished fifth in Australia. Nasr was the last driver to change tires, and he briefly ran as high as second as others stopped. He crossed the line in seventh, but gained a place when Kimi Raikkonen was penalized. “I’m very happy I have to say, it’s been a long time that I haven’t been so up there,” he said. “I was surprised how quick the car was today, especially on the supersoft. We were able to pull away quickly and the time was coming quicker and quicker. The team did a fantastic job strategy wise, and I’m so glad we brought such good points for the team.